There is no single unique way to perform a “correct necropsy”, rather there will be the “most appropriate way” that fits a particular purpose. Once the objective is clearly defined, however, it is essential to achieve a good level of standardisation in order to allow for comparisons across time and cases. the necropsy procedure involves an extensive anatomo-physiological examination of the fish and as a general rule, should be performed as soon as possible after death. If a clear work plan and all the equipment and materials are prepared in advance, it helps to reduce the time between death and necropsy. During the procedure pay special attention trying to avoid distorting the normal architecture of tissues by crushing, compressing or tearing, which can increase the risk of introducing artefacts and compromise the analysis further down the line i.e. histopathological examination. A regular practice will help to develop the appropriate level of skill. The ideal conditions are usually found in a laboratory environment, where equipment and comprehensive support are available. However, for different circumstances necropsy is frequently performed out with the laboratory and this should not be a major constraint. In principle, conditions can be adapted to perform the necropsy on site, with the advantage that this shortens the time lapse between detection of the problem or the onset of death and the necropsy. 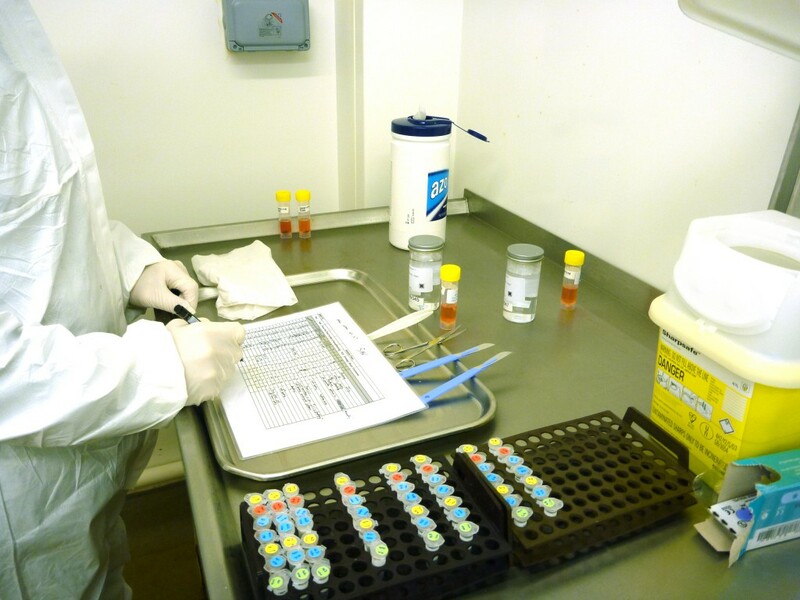 All possible efforts should be made to prepare for “field conditions” and provide a correct and expeditious transport of the samples to the laboratory. The number of specimens examined will be determined by the purpose of the procedure, but the principle is that samples must represent the population or the group under study. Thus the number of fish examined is tailored according to objectives and therefore anything from a single specimen (e.g. valuable ornamental fish) to several hundred fish (monitoring or surveillance) may constitute a valid sample size. For instance, in farmed populations suspected of a pathological condition, typically between 5 and 10 animals displaying the observed problem (clinically affected fish) are examined, alongside a smaller number of non-clinically affected individuals. However, the sample size can increase significantly when necropsy is performed to determine the extent of an infection or the presence or absence of a given pathological agent. For pathogen screening the number of fish is statistically calculated considering the expected or threshold prevalence of the pathogen, the level of confidence desired on the results and the performance of the method or test system applied (sensitivity and specificity). In general terms the lower the pathogen prevalence and higher confidence required, the larger the number of fish that will be examined. The procedure and the subsequent processing are described in codes and guidelines of international application (e.g. Manual of Diagnostic Tests for Aquatic Animals, International Organization for Animal Health, OIE) and the population size it is also important, however, it is acceptable to assume that it is infinitely large (see the OIE Aquatic Manual).